Some people stock up on pumpkin, candy corn, or other seasonal treats–I stock up on cranberries. Year-round you’ll find bags of organic cranberries in my freezer. You may think I’m crazy, but after one bite of this recipe you will understand why! 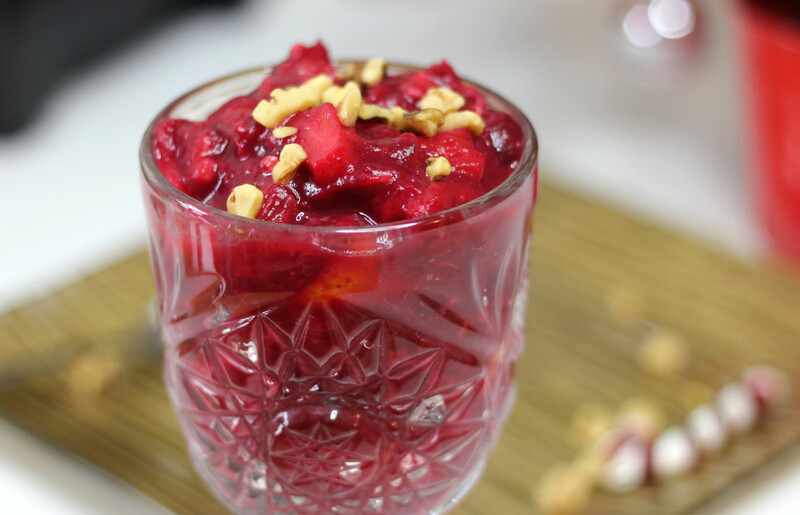 My variation of this simple cranberry sauce is not just a sauce…it is a DESSERT. You’ll find yourself wanting to eat it plain, with a spoon, similar to how you eat ice cream or pudding. Or at least I do. The best part: the only ingredients are fruit and nuts! If you’ve ever made homemade cranberry sauce (or are familiar with it), you know one of the main ingredients is SUGAR. This version is made with pineapple, which adds a lot of sweetness so you can forgo adding sugar. Cranberries are known for reducing inflammation, and studies show they protect your cardiovascular health and prevent gum disease. Cranberries benefit your immune system and may reduce or prevent the frequency of colds and flus. As are most fruits, they are full of Vitamin C and antioxidants that are great for your skin! This makes a slightly “tart” cranberry sauce, for a sweeter sauce add more coconut nectar, stevia, or maple syrup. You can omit the coconut nectar completely for a 100% fruit and nut based sauce. I enjoy this best very cold (refrigerated), but you can eat it hot as well. Try it out and let me know what you think! Are you a new cranberry addict as well? Happy Thanksgiving to you and your loved ones! Chop up the orange into 8 segments, then chop each segment in half for 16 pieces total. Leave the rind on the orange pieces. In a saucepan, combine 1 cup water, cranberries, chopped orange, coconut nectar, cloves, and cinnamon. Bring to a boil and reduce to low. Simmer 10-15 minutes until cranberries pop and sauce thickens. Remove from heat and add the pineapple and walnuts. Cool, stirring every so often so the flavors continue to combine. Remove the orange segments before serving, or eat around them. Enjoy! Did you like this recipe? You’re going to love my FREE “Top 5 Vegan Breakfasts for Tons of Energy” recipe guide! Here’s a hint: it’s not oatmeal or fruit!